What do you do with all the rubber bands you collect in a day? Maybe you have never thought about rubber bands before? In an attempt to cut back on what I put into landfill, with each day I become more aware of all the very minute details which contribute to the ‘stuff’ I throw away. The rubber bands that I inadvertently collect, are generally from the grocery store, holding my organic produce together or sometimes the newspaper that is delivered to the house has one (or two?) to keep it folded; when its not sealed in a compostable plastic bag. I can’t think of any other instances whereby rubber bands sneak their way into my home. I can always find a use for something with elastic properties. I have used wide ones around stubborn lid caps to get a better grip in order to open them. However, I’ve lately turned to using my rubber kitchen gloves for that job. So, while at this point I haven’t been able to completely eliminate rubber bands from entering my life, the one thing I can do is to make sure that they don’t go into the landfill while they still have a use. Over the years I started wrapping them into a ball and keep them in a handy kitchen drawer. I remember the day I showed my two young kids at the time, my super bouncy rubber-band-ball; with wide eyes they were speechless for the two seconds it took the ball to bounce on the ground and soar into the air, followed by shouts of joy and pleads to do it again. That was a great moment! Here is story about Zack Hample who has been building his rubber band ball since the age of four. Now, after 32 years of adding to his ball it has grown immensely and weighs in at over 250 pounds. 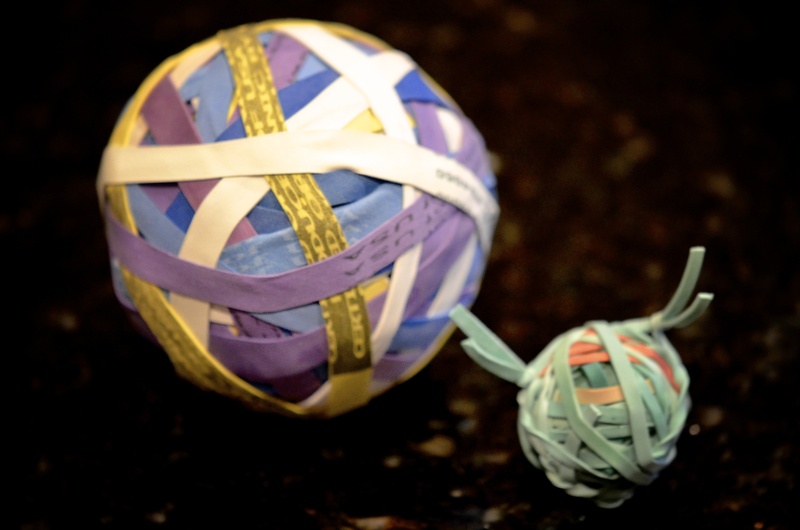 What probably started as a use for household or found rubber bands, turned into a lifelong hobby. Though it appears as though he purchases new rubber bands for adding on to his very large rubber ball. To grip a slippery surface (jar lids, or put around shampoo bottles etc. making them easier to grip when wet). A temporary fix for a leaky pipe until a plumber arrives. 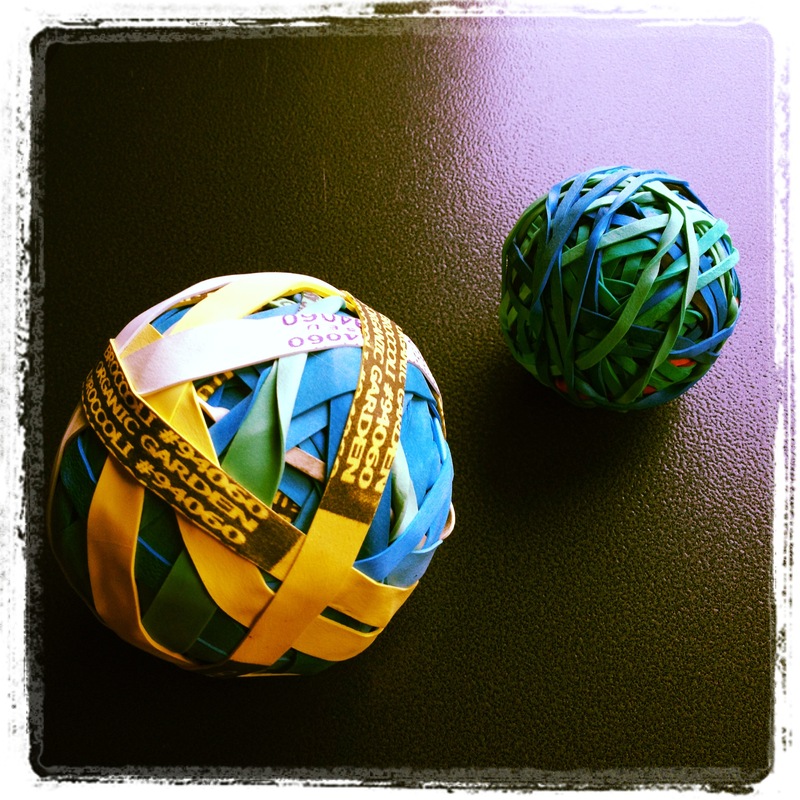 How do you reuse your rubber bands?